Social Activism Off the Ice for Speedskaters When American speedskater Joey Cheek won the 500-meter race at the Olympics on Monday, he used the opportunity to make a statement. Cheek announced he was donating his $25,000 gold medal award from the United States Olympic Committee to support child refugees who have fled the bloodshed in Sudan's Darfur region. And he urged Olympic sponsors to give as well. Social activism combined with generosity certainly isn't the norm for elite athletes. But it's not without precedent in speedskating. 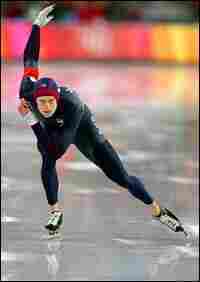 Joey Cheek of the U.S. on his way to winning the Olymic gold medal in the 500-meter men's speedskating competition in Turin, Feb. 13, 2006. When American speedskater Joey Cheek won the 500-meter race at the Olympics on Monday, he used the opportunity to make a statement. Cheek announced he was donating his $25,000 gold medal award from the United States Olympic Committee to support child refugees who have fled the bloodshed in Sudan's Darfur region. And he urged Olympic sponsors to give as well. Social activism combined with generosity certainly isn't the norm for elite athletes. But it's not without precedent in speedskating. Cheek is following in the long strides of Johann Olav Koss, the Norwegian speedskater who won three gold medals at the 1994 Games in Lillehammer. Koss, who is now a physician, donated much of his Olympic bonus money to children who were victims of the fighting in Sarajevo. The Bosnian capital was the host city of the 1984 Winter Olympics. Koss went on to start a humanitarian effort called Right to Play, which seeks to provide a bit of normal childhood -- games and sports equipment, visits from athletes -- to kids living in refugee camps. After winning his gold medal Monday, Cheek said he drew inspiration from Koss, both as a skater and as an athlete who finds a way to become useful outside of sports. The world of sports takes itself very seriously, and Olympic officials are perhaps the worst offenders of all. But International Olympic Committee President Jacques Rogge could not be faulted when he said this of Johann Olav Koss: "Many champions at the end of their career bask in their glory, after years of hard work. Athletes tend to be egoists. Johann is an exception." Cheek hasn't ended his athletic career yet. He is expected to compete in at least two more races in Turin. But already he is an exception, too.